Ahly winger Ahmed Hamoudi is cleared fit for the game against Tunisian side Esperance in the second leg of the CAF Champions League final on Friday after recovering from an ankle injury he sustained during the first leg game, while veteran midfielder Ahmed Fathi will continue his rehab program, the club announced on their official website. Hamoudi participated in the Red Devils' training session on Monday within preparations for the second leg of the Champions League final. 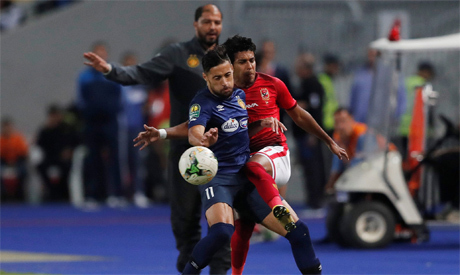 The 28-year-old winger, Hamoudi sustained an ankle injury during Ahly's 3-1 win over Esperance in the CAF Champions League final first leg at Alexandria's Borg El-Arab stadium on Friday. "Ahly's influential right-back Ahmed Fathi, who suffers from a muscle injury he sustained during the first leg game, is continuing his rehab program to recover from the injury," read a statement on Ahly's offiacial website on Monday. The Cairo giants crew will fly to Tunisia on Tuesday morning to prepare for the crucial game against Esperance in the second leg of the CAF Champions League final at Stade olympique de Rades.